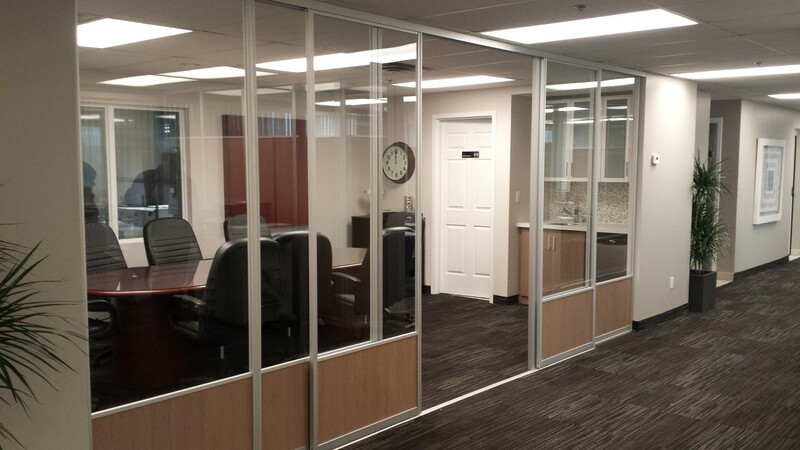 Komandor’s Wall Partition System offers customers an engineered solution to divide large open spaces into rooms, hallways or office space. 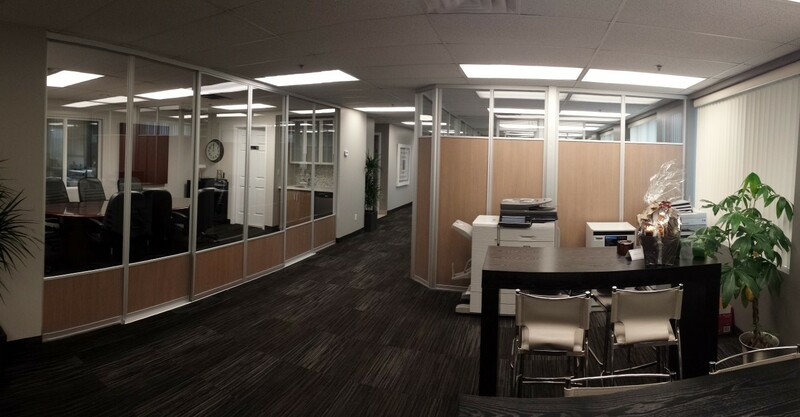 Our customer, a manufacturing company was undertaking a renovation of their facility and needed to quickly turn a large open space in their building into office work spaces and a boardroom. Timing was critical as the system had to be installed in just a few weeks. The office would also be staffed while the work was being done so this posed its own problems. Custom sized wall panels were manufactured and assembled at Komandor’s factory and then simply connected together and installed on site. 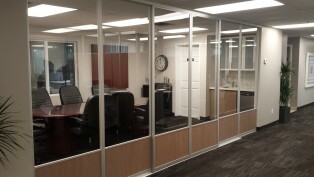 This system avoided the workday disruption and construction debris that would have followed a traditional wood or metal framing and drywall finishing job. 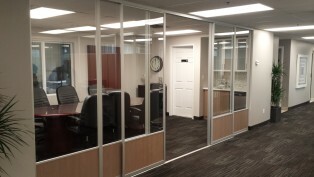 Sliding entry doors to eliminate door protrusion into offices. This maximizes usage of office square footage and offers more flexibility for furniture placement. 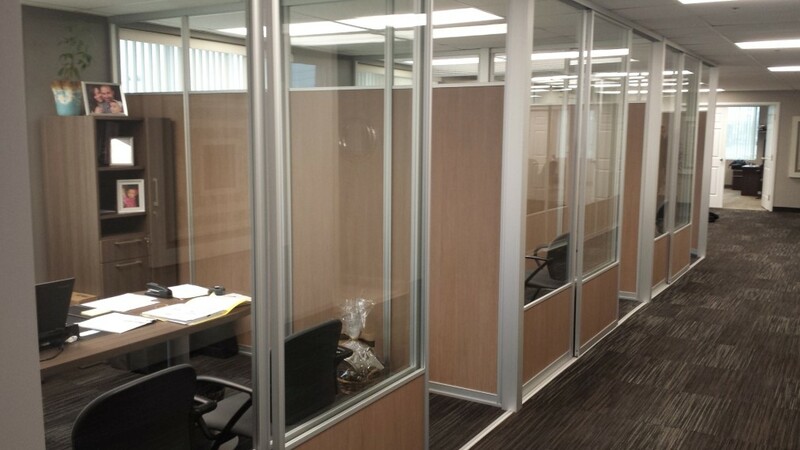 Fixed wall panels and sliding doors with a mix of clear tempered glass and Austrian Larch laminated panel. 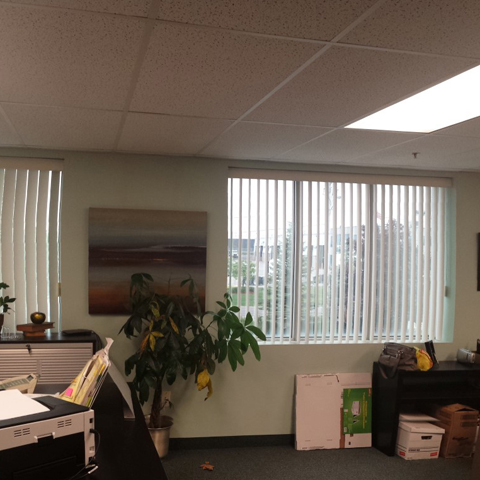 This allows light from exterior windows to penetrate the entire space. Grills inserted in certain wall panel sections to allow for ventilation between office work spaces. 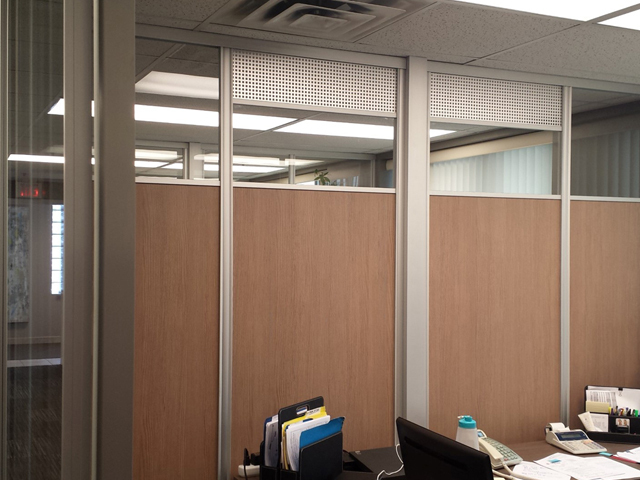 Angled wall corners to soften the aesthetic appearance of the office work spaces. Electrical conduit run through posts to house outlets and switches. System installed to existing T-bar ceiling. A coffee station in the boardroom complete with sink, dishwasher and upper cabinet storage framed with Komandor’s aluminum cabinet doors and frosted glass.